burgundy is the best color. to me, it will always be the color of fall, of winter, of holidays, and an ever-sophisticated, ever-rich alternative to plain red. how does one pay homage to a color? well, this gift guide is a start. what's your favorite color? have you started your holiday shopping? P.S. : my best holiday sales roundup. new listings at my shop here. So funny, because after obsessing over the Canada scarf from your earlier post I've decided to put it on my christmas wishlist in the wine color. And I also just added a pair of NB in burgandy to the list as well! We are on the same wavelength here... I've been trying to decide which NB I like best and I think I actually will go with the more streamlined 410s, which are available in a very pretty burgandy over at asos, in case your interested. I have always loved burgundy. It just looks so beautiful paired with navy, cream, and grey. You're right it is rather sophisticated and rich. It's one of my staples for autumn and winter. I very much prefer it to red, which I'm not a fan of. A burgundy cashmere scarf and my burgundy Repettos do the trick. I've been enjoying burgundy lately too, particularly around my mouth - lots of berry red lips and berry tea at the moment! 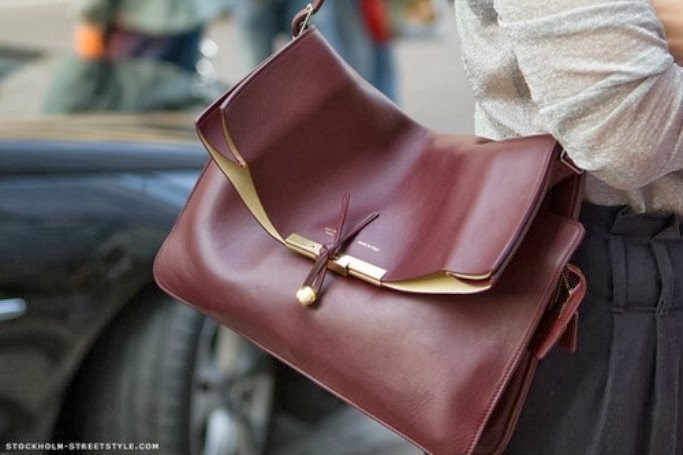 That clasp on the Celine purse is just so elegant. Sigh. Love burgundy too - this post has inspired me to pull out my DVF burgundy duffel, picked up during Christmas sales last year. It pairs beautifully with navy and grey - my two favourite colours. Love this colour so much, mainly because it's a nice accent to my favourite colour, navy, haha. It's much nicer as an accent - when I wear a burgundy-coloured dress or shirt I feel so matronly. I was stalking a pair of Dieppa loafers in beige but these burgundy ones are very tempting! i saw those dieppas last year and was just agog at the richness and patent combo. i say go for it - it will suit you well (patent being practical for rainy days too)! 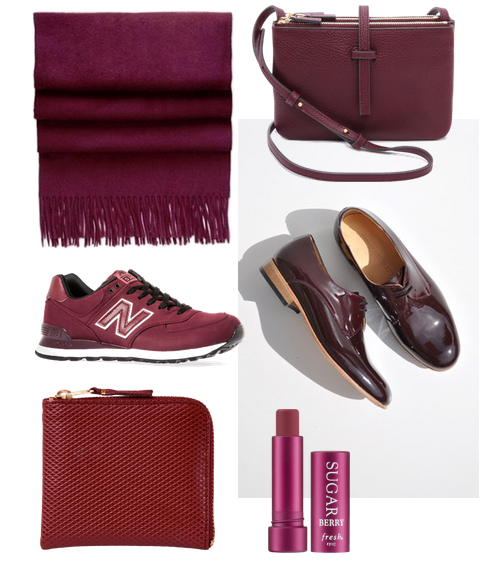 Burgundy is my favorite non-neutral neutral. My glasses are burgundy and I have a fair amount of it in my wardrobe. I also want to find a perfect burgundy lipstick. It pairs with practically everything expect chartreuse. exactly right - mine too! mmmm may i suggest the bordeaux nail polish by essie too. I love this color - i have a ps1 in burgundy & have been using it non stop for the past year. Literally the only bag I have been using. It's great in the winter, but also wonderful in the summer time. Plus it's polished enough that I can wear it to client meetings and not look sloppy. love your burgundy ps1! i've admired that version many many times too. Another fan of burgundy here! I use it more as an accent, like on the lips, or with accessories like a scarf, socks etc. It's such a flattering color in winter. Not as flashy as red but not washed-out either. Did you get that trio bag? I'm very tempted to get it in that color! Here here to burgundy and the winter! I have a Celine trio and burgundy and it perks up my black/navy outfits instantly. A great lip color I recently found is Nars Vendanges. I love the name too. And my favorite nail color of all time is Nars Chinatown which looks amazing both on toes and nails year round. i love a burgundy mani in fall/winter. i'm going to have to get one before the holiday parties!